He was educated in the public schools of Southfield, and Bloomfield Hills, Michigan. Lorenzo is the father of four children: Rayven, Kierra, Kyesha, and Kyle. Rev. Robertson publicly acknowledged his call to preach the Gospel of Christ in October 1995. The Lord has endowed Rev. Lorenzo Robertson with wisdom and understanding which led to him being ordained in the ministry in the year of 2000. As an Associate to Pastor James Jennings Sr. of the New True Vine Baptist Church of Detroit, MI; he was often called upon to preach the morning sermon and afternoon fellowships. He was responsible for overseeing the administration and maintenance of the church. In his capacity of Adult Sunday School Teacher and frequent Bible Class Instructor, his talent for expounding the word of God is evident. In August of 2005, Rev. 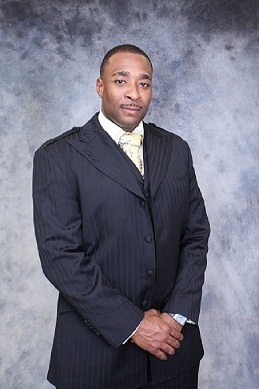 Robertson accepted the call to pastor the New Jerusalem Missionary Baptist Church of Pontiac, MI. Religious affiliations include National Baptist Convention, USA Inc.; Central District Baptist Association; Council of Baptist Pastors and Ministers Alliance; and the N.A.A.C.P. Rev. Lorenzo Robertson has great love and compassion for people. He has a special affinity for children and senior citizens. He often states, "Life's greatest lessons can be learned by watching children play and listening to elderly speak." Man of God, Father, Son, Brother and Friend.